There's a better way to budget. HBR Research: How is your organization using insight? Weekly Hotlist: Do You Have a Manager's Mindset? What's Your Office Politics IQ? Weekly Hotlist: What Is Disruptive Innovation? 20% Off: Limited Time Cyber Monday Offer Ends Tonight! Weekly Hotlist: What Kind of Thinker Are You? 20% Off: Extended Today Only! Virtual collaboration is fast becoming the norm. Are you ready? Last Day to Save 40% - Cyber Monday Extended! Weekly Hotlist: Emotional Intelligence Has 12 Elements. Which Do You Need to Work On? Your Organization Wastes Time. Here's How to Fix It. Last Day to Save 35%! Weekly Hotlist: Can You Be a Great Leader Without Technical Expertise? Are you having trouble viewing this email? If so, click here to see it in a web browser. If you’re looking to rise through your organization’s ranks, but aren’t sure how, consider creating a personal board of directors. This informal group comprises six to eight people who can help with your professional development. There are three types of people you should include. First, you need fans — people who support you and will deliver tough feedback with kindness and good intent. Second, recruit potential sponsors — senior leaders who can advocate for you when it’s time for a promotion. Third, include at least one critic. These people may be the toughest to approach, but they can be the most valuable. Look for people who have deep-seated perceptions of you and are likely to block you from advancing. If you enlist their help, you may be able to shift the relationship into a positive one and use their criticism to grow. 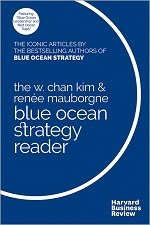 The seminal book “Blue Ocean Strategy” has sold over 3.6 million copies globally and is in print in 44 languages. But much of W. Chan Kim and Renee Mauborgne’s work on creating new market spaces was originally published in the pages of Harvard Business Review. This book brings the best of those articles together all in one place. Piece by piece, these articles explain the process of creating “blue oceans” and help you implement it in your organization. SWOT analysis is a valuable tool to help you identify your company’s strengths, weaknesses, opportunities, and threats. Why? Understanding both the external environment and your organization’s internal capabilities is crucial to informing your goals and strategy and making the right business decisions. HBR Tools: SWOT Analysis delivers a comprehensive overview of the key concepts with detailed examples and includes a customizable PowerPoint template to help you and your team successfully perform and present a SWOT analysis for your company or project. Copyright © 2017 Harvard Business School Publishing, an affiliate of Harvard Business School. All rights reserved.